This year began with an early start for many plants, trees and flowers, but the cold weather in April and even early May slowed it all down. By late May things were coming out rather late. I have been watching new swans, ducks, geese and moorhens arrive. Swans nest on a huge mound of twigs and reeds, usually in a safe place. The one on the “dead arm” of the canal had five cygnets this year. Geese make a soft pile of down plucked from their own feathers. The gander guards his mate like the cob (male swan) does. Both sit on their eggs for several weeks. Ducks seem to brood anywhere and everywhere, including gardens and houses! Moorhens make a more conventional bird’s nest out of reeds and sedge, but do it in silly places, like by the towpath, where they get scared off and leave the eggs exposed. One came and went near me within a few days. This month I am looking around the area from Bittell to Hopwood. There is a complex of waterways around here: the canal and its little arms, feeder leats and streams, the River Arrow, the two reservoirs, fishing lakes and smaller ponds. Water quality isn’t brilliant but those responsible are working hard to improve it. The Bittell reservoirs have very interesting plants alongside, even in the bits you can walk. Most of the reservoir side is private land and some of it is a Site of Special Scientific Interest with rare shoreline plants. But you can walk along the canalside next to the lower reservoir, and round by the new fishing lakes. You can also reach the raised bank alongside the upper reservoir, where there are lovely cowslips in spring and water bistort later. If you are lucky in June and July you should see bee orchids on the grassy bank alongside the canal near the cottage at Bittell moorings. This depends on whether the Canal and Rivers Trust get their mowing regimen right. This year they didn’t, and mowed it in error at the end of May when the orchids were coming up. They have survived and flowered – just. This patch doesn’t only have orchids: it starts with cowslips in spring, then ground-ivy, a herb that was made into a herbal tea or used as the bitter element in beer. Then with the orchids are bird’s foot trefoil, fox-and-cubs, camomile, moon daisies and self-heal – now coming back after the mowing. Further along the bank was a mass of campion, mostly mown down now, and then a piece which was wooded until the trees were cut down. Here there are wild garlic and white violets in the spring, each having a strong but very different perfume! These plants are here because of the habitat. The sides of reservoirs are open, with good views. They can grow meadow flowers, like orchids and moon daisies, being open to the sun, but unfortunately the mowing regimens usually keep them as short grass. The piece where trees used to be still has woodland flowers: I don’t know how long they will stay here. 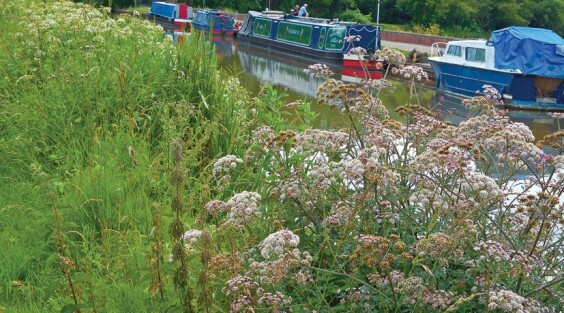 The plants directly along the canal – the aquatic fringe – are usually left to grow freely here. In June it was full of yellow flag irises. In July you will find the full range: meadowsweet, skullcap, purple loosestrife, marsh woundwort, water bedstraw, lady’s bedstraw and wild angelica, yellow and blue vetches, as well as plentiful willowherb. You can tell from those names that many are herbs. Woundwort, for example, was used to staunch wounds and has real styptic properties. Skullcap was used to ease stress and promote calm. The two bedstraws are both masses of tiny scented flowers, one white and one yellow. Both were used, along with meadowsweet, as “strewing herbs” – to scatter on the floor and keep rooms smelling sweet. They were also stuffed into mattresses to make a sweet-smelling filling, hence the name. If you walk past on a warm day you can smell them. Wild angelica (above) is one of the parsley family, and is big, fleshy and slightly purplish. Its stems can be candied, like that green stuff we used to have on trifles, or just used to sweeten fruit. You can also use elder flowers and meadowsweet for this. Before people had much sugar, they often used flowers as sweeteners. Elder is everywhere at Bittell! Bittell is a good place for water birds, which like the habitat of the reservoir, the canal and the fishing lakes. There are two nesting sites for swans nearby, and they usually bring their cygnets through here. Geese have a favourite patch near the unoccupied cottage. There are some less common ducks too, including the mandarin, which I saw flying here recently. I think the “wood duck” which has settled round here is more likely to be a female mandarin: they are very similar. Mandarins don’t interbreed with other ducks, and I think we may have a breeding pair round here because of the arrival of a new one last year. The ducklings look very similar to mallard ducklings. If you look for the mandarin drake at the moment, it has lost most of its colour, as most drakes do in summer. On the reservoirs you can see great crested grebes and coots. Swallows skim over the water in spring and summer. There have been recent sightings of otters round here. The CRT’s environmental officer showed me evidence of their “spraint” under a bridge. Unfortunately I have heard of one being killed by fishermen. I hope that’s not true: otters are protected and are rare on canals. There is plenty of fish for us all. The area round the lower reservoir and fishing lakes is also full of rabbits. You often see them round here, especially when they are young and haven’t learnt to keep out of the way. Trees here are good, too. There is a lovely pear tree and a wild plum near the cottage. Over beyond the fishing lakes, stretching between Bittell, Hopwood and the main Alvechurch road, is Mick’s Wood, planted nine years ago. This is a mixed woodland, all native trees, and has become established now with blossoms and fruits. It has great birds, including the elusive willow warbler. The cuckoo came back there this year – I was delighted to hear it in May and June. The footpath by the fishing lakes goes past the wood. You can get to this footpath from the canal bridge just past the lower reservoir. The stretch around the new lakes has rather odd flowers, being recently disturbed, and sometimes has rather spectacular hemlock flowers. If you walk on past the bridge up the canal, the towpath takes you to Hopwood. It’s an interesting walk, especially as it’s one of the few places around here with flourishing elm trees. There must have been elms everywhere round here up to about 50 years ago when they died from Dutch elm disease. In many cases, you can still see evidence of them because small sucker-grown trees have remained. However usually these are sterile, and don’t flower or fruit. I have noticed these especially all round the churchyard at St Laurence where there were once magnificent elms. There are little copses of them in Scarfield Dingle and by the aqueduct in Aqueduct Lane. The hedge along the main Birmingham road into Alvechurch near the school is also full of it. Some of you who were here then may remember our villages with their elms. On the farm where I lived as a child, a line of fine elms were the only big trees we had apart from introduced Monterey pines (typical of that windy part of the Devon coast). They all went, and provided some good firewood for a while! It’s a sobering thought that this could happen to our ash trees. However, there were some elms that survived. They are quite common still in Scotland, and around here they appear in odd places – like these along the towpath near Hopwood. Scientists are looking closely at ash trees to see if they can find the reasons why some may be resistant to disease, as some elms were. Earlier there is an unusual spring flower called goldilocks. This is the first buttercup to appear, and has fine feathery leaves and bright yellow flowers that are always slightly imperfect, missing some petals. These also grow in Eades Meadow – they love undisturbed open grassland. There is some in St Laurence churchyard too, but this year it was all mown down. It seems to like churchyards – it grows in my sister’s local church in North Yorkshire as well. Hopwood has very good trees, including some sweet chestnuts on the side of the main road. July is the flowering time for these. The flower heads are strings of tiny greenish flowers, with a strong and rather musky smell. Later, of course, they produce edible chestnuts, but these only grow to a good size if we have a fine, warm summer. Sweet chestnuts were introduced here many centuries ago and are well-established in old woodland. They have a long life and when old have very attractive twisty bark. There are some big ones like this in Pipers Hill and Dodderhill Common near Bromsgrove. By the time you read this we may know if the summer looks like being good enough to pick chestnuts later in the year! This poem is one I wrote after walking near Hopwood. Fields of gold and sighing meadows. Quite make it whole into the spring. Is just like us, surviving despite the bears.